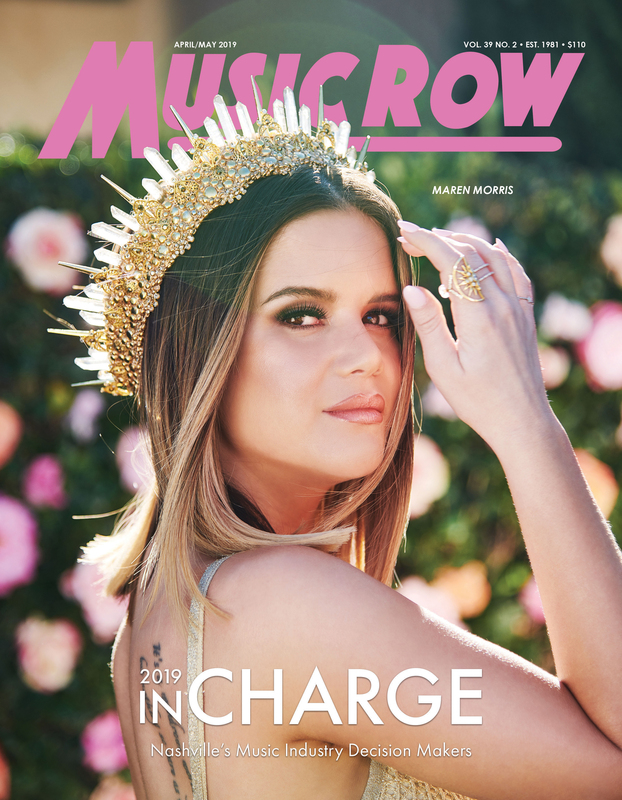 Nominees for the 27th annual MusicRow Awards, Nashville’s longest running music industry trade publication honors, have been revealed. This year’s BREAKTHROUGH ARTIST category is stacked with entertainers who are also talented tunesmiths, having co-written almost all of their debut albums. The fastest rising female act in eight years, Maddie & Tae scored with sassy debut single “Girl In A Country Song.” It reached No. 1 at country radio, sold over 600K downloads, and reeled in over 22 million VEVO video views. They co-wrote all four titles on their EP, and earned an ACM nod for Vocal Duo of The Year. They are about to head out on Dierks Bentley’s Sounds of Summer Tour. Kelsea Ballerini’s self-penned debut single “Love Me Like You Mean It” is quickly scaling the country radio and sales charts, while debut album The First Time hit shelves this week. She is co-headlining the career-boosting CMT Next Women of Country Tour. Chase Rice’s album, Ignite The Night, debuted at No. 1 on the country albums chart. It yielded the Platinum-certified, Top 5 hit “Ready Set Roll” and new follow-up single “Gonna Wanna Tonight.” He sold out nearly every stop on his own Ignite The Night Tour last year, and will keep the momentum going on Kenny Chesney’s The Big Revival Tour this summer. Sam Hunt’s Montevallo is the best-selling country debut album since 2011, and the best-selling country album of 2015, with sales topping 500K. The Georgia native earned back-to-back Platinum singles with “Leave the Night On” and “Take Your Time.” Hunt co-wrote every song on his album, including “Cop Car,” made famous by Keith Urban. He also has writing credit on the Billy Currington hit “We Are Tonight.” Hunt spent the fall on the CMT tour with Kip Moore. Cole Swindell, MusicRow’s 2014 Breakthrough Songwriter of the Year, is back with a nomination for Breakthrough Artist after a blockbuster year. He earned three straight No. 1s: Platinum-certified “Chillin’ It” and Gold certified “Ain’t Worth The Whiskey” and “Hope You Get Lonely Tonight.” As a songwriter, he has credits including “This Is How We Roll” (Florida Georgia Line ft. Luke Bryan), “Roller Coaster” (Bryan) and “Get Me Some of That” (Thomas Rhett), the latter two songs were penned with Breakthrough Songwriter nominee Michael Carter. Next up Swindell will head out on tours headlined by Jason Aldean and Kenny Chesney. The MusicRow Awards are often a key predictor for select CMA Awards. 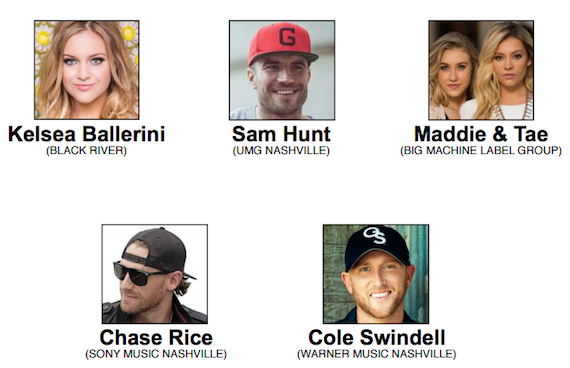 Almost every year since 2006, MusicRow’s Breakthrough Artist winners also received the CMA New Artist/Horizon Award later the same year, including Kacey Musgraves (2013), The Band Perry (2011), Zac Brown Band (2010), Lady Antebellum (2008), Taylor Swift (2007), and Carrie Underwood (2006). Award winners are voted on exclusively by Subscriber Members of MusicRow. Honors will be presented during an invitation-only ceremony at ASCAP on Tuesday, June 23 at 5:30 p.m., saluting the Breakthrough Songwriter, Breakthrough Artist, Producer of the Year, Song of the Year, and the Top Ten Album AllStar Musicians. The eligibility period is May 1, 2014 – April 30, 2015.